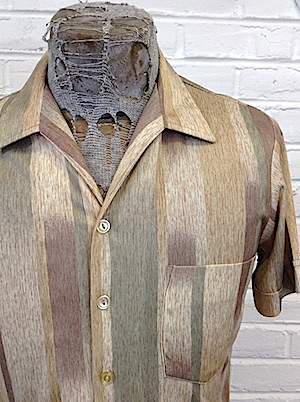 (S) vintage 1970s mens shortsleeve DISCO SHIRT muted tan, green, purple, brown. 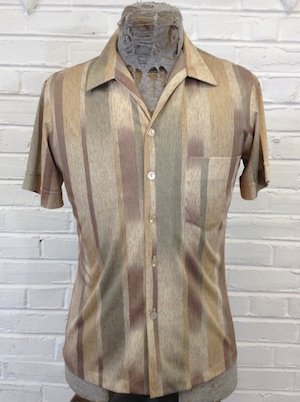 Home > Men's Vintage Shirts > Disco Shirts > (S) vintage 1970s mens shortsleeve DISCO SHIRT muted tan, green, purple, brown. Very nice vintage 1970s mens shortsleeve disco shirt. Abstract vertical bands pattern in muted tones of: light tan, sage green, purple, brown, and sand. Left chest patch pocket. Not a huge collar, but still very 70s style. No top button for a V neckline. Cuffed shortsleeves. Made by Triumph of California. 100% polyester.